Bohrium atoms have 107 electrons and the shell structure is 2.8.18.32.32.13.2. The ground state electronic configuration of neutral bohrium is [Rn].5f14.6d5.7s2 (a guess based upon that of rhenium) and the term symbol of bohrium is 6S5/2 (a guess based upon guessed electronic structure). Bohrium: description Your user agent does not support the HTML5 Audio element. Bohrium is a synthetic element that is not present in the environment at all. The German discoverers at GSI proposed the name Nielsbohrium (symbol Ns) after Niels Bohr. IUPAC are happy to name an element after Bohr but suggest bohrium (Bh) on the grounds that the first name of a person does not appear in the names of any other element named after a person. This seems to have been accepted by all concerned. 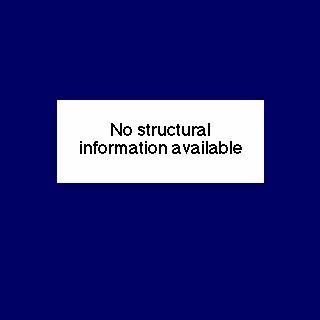 The solid state structure of bohrium is: bcc (body-centred cubic). Reactions of bohrium as the element with air, water, halogens, acids, and bases where known. Binary compounds with halogens (known as halides), oxygen (known as oxides), hydrogen (known as hydrides), and other compounds of bohrium where known. Bond strengths; lattice energies of bohrium halides, hydrides, oxides (where known); and reduction potentials where known. Bohrium was discovered by Peter Armbruster, Gottfried Münzenber and their co-workers. in 1981 at Gesellschaft für Schwerionenforschung (GSI) in Darmstadt, Germany.. Origin of name: the origin of the name is Niels "Bohr", the Danish physicist.. 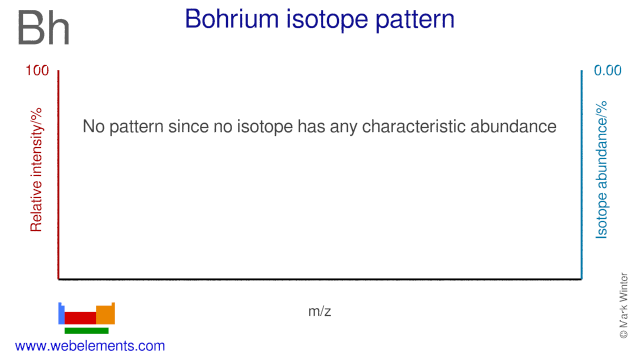 Isotope abundances of bohrium with the most intense signal set to 100%. Isolation: only a few atoms of element 107, bohrium, have ever been made. The first atoms were made through a nuclear reaction involving fusion of an isotope of lead, 209Pb, with one of chromium, 54Cr. Isolation of an observable quantity of bohrium has never been achieved, and may well never be. This is because bohrium decays very rapidly through the emission of α-particles. More recently, other isotopes have been made at the Paul Scherrer Institute (PSI) in Switzerland. In this work, it appears the scientists concerned feel bohrium forms the oxychloride BhClO3.